We are open throughout the entire year to help you make the best memories with your family, friends, and co-workers! We are located on 40 acres of beautiful property alongside Round Lake. With our versatile facility, we can equip you to host an unforgettable event. Whether it be family party or reuinion, a church group, school or business retreat, grad party, or wedding, we have an option for you! Our Retreat Center is easily accessible and located near a beautiful backdrop of woods. The top floor of this building features a large, open meeting space. Also located in our Retreat Center are bathrooms and showers for both men and women. Our dining hall can serve up to 100 people at a time. We have 10 round tables, and up to 100 chairs, that we will set up depending on your group size. This building also has a large, well-equipped kitchen with stoves, a convection oven, refrigerators, dishwasher, and cooking and serving equipment. Although the dining room is available to all groups, the kitchen is accessible only to groups doing their own food service. Two bathrooms can also be found in this building. We have 7 cabins, with 88 beds total. Four of our cabins house 10 people, and the other three are 16-person cabins. Above is one of our 10 person cabins. Each cabin has both a front and back door, two windows with shades, two fans, a heater, a small table, a small coat rack, and a broom and dustpan. Most of our cabins have vinyl covered mattresses. Oldebeken Retreat Center is the hub of all activities at SON-Life, featuring meeting space, back deck, bathrooms & showers, game room, and our camp offices. Here's a look at how one of our groups had the room arranged. We can set it up however you desire, with up to 100 chair and 10 tables available. 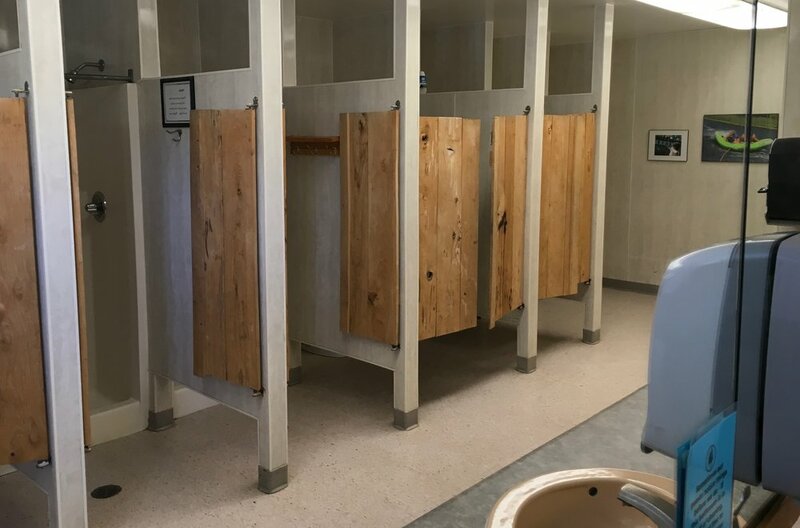 Here's what bathrooms in the Retreat Center look like. Showers are also located in the Retreat Center bathrooms. The Game Room in the basement of the Retreat Center. Some comfy seats in the Game Room. A look at a few cabins near the Dining Hall. A few of our cabins to the north of the Retreat Center. Here's a glance at the inside of one of our cabins. Most matresses are vinyl covered. Our Dining Hall can host about 100 people, with up to 10 round tables, and 100 chairs available. Here's the kitchen area in our Dining Hall. Our waterfront area is availale for swimming, boating, and blobbing. We have about 8 canoes, 6 paddleboats, 10 kayaks, and 5 stand-up paddle boards avialable for your group to use. We have a sandy beach area at waterfront, ad well as boating, swimming, and blobbing. Blobbing must be requested at least 3 weeks in advance, so we have ample time to ensure we have lifeguards available to run the activity. Gaga Ball, Basketball, and 9 Square In the Air are a few of many games and activities we have avialable for your group. Tomahawks, as well as archery, blobbing, mountain boarding, and team-building initiatives can be rented out from us. Please request these at least 3 weeks in advance so we can ensure we have staff available to run these activities. Our campfire area can seat about 75 people around a centrally located fire ring. It's very near Round Lake, so evening sunsets will be able to set the mood for your group here. We have also recently updated our benches. The Outdoor Chapel is a fairly new addition to our facilities. Follow the lakeside trail down towards the lake from behind our Retreat Center and you'll arrive here. It right on the edge of the lake, has seating for 65 people or so, and a stage next to the lake. Our hope is that your group will be able to find rest, relaxation, and rejuvenation during your stay at SON-Life Camp. Book your wedding with us! Our beautiful Outdoor Chapel is an excellent location for an intimate-style wedding. With space for about 80 guests, the Outdoor Chapel at SON-Life, secluded by woods, with a great view of Round Lake, creates a serene environment for that unforgettable day. SON-Life Camp is a great spot for your high school graduation open house. Want to see SON-Life Camp in person? We offer tours for those who would like to check us out. This is a great time to envision your retreat here and get any questions you have answered. *SON-Life Camp & Retreat Center reserves the right to cancel high adventure activities for any group, in the event that weather does not permit, or staffing cannot be scheduled.